The Cub Scout uniform is a short sleeved Blue shirt, Den neckerchief,slide, and hat. The uniform can be purchased at our local Hawk Mountain, Beaver Service Center (located at the intersection of Rt 61 and Cross Keys Road). You can also purchase the uniform at Dietrich's Men Shop in Hamburg, www.scoutstuff.org or you may also find it on Ebay. Pack 190 also has an orange Class B T-shirt that can be worn on occasion. The pack will designate the events when the Class B t-shirt is appropriate. 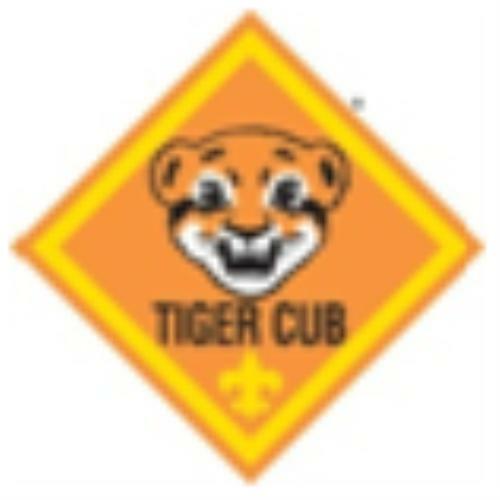 The following patches are worn on the uniforms of Cub Scouts from Tigers through Webelos Scouts. These patches are Rank Badges and are earned as the Cubs progress through the various ranks in the pack. The appropriate placement is pictured above. 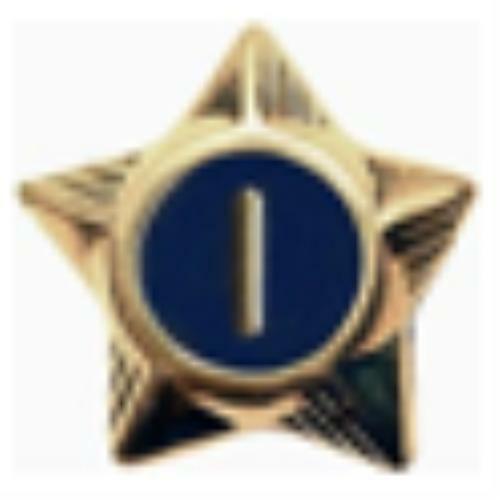 This badge is the first badge earned before any other badge can be earned. It is worn on the left pocket. The Tiger Cub badge is for boys who have completed all 15 parts of the five achievements, that is, five family activities, five den activities, and five Go See It outings. It is worn on the left pocket. 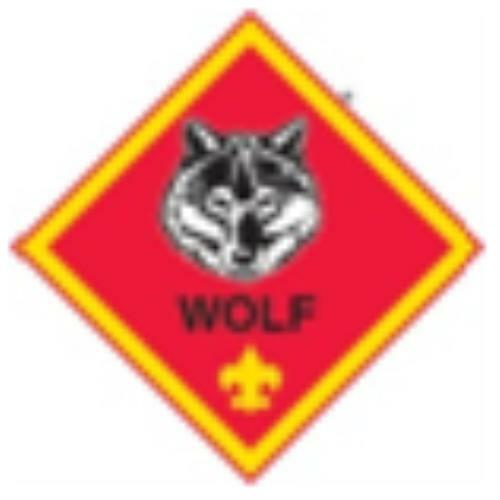 This badge is earned by boys who have completed the 12 Wolf Achievements. It is worn on the left pocket. 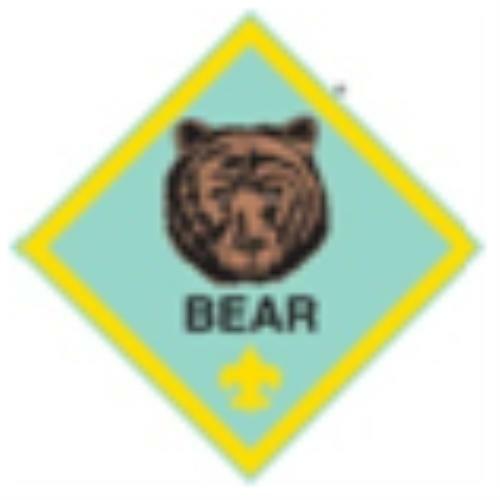 To earn the Bear badge, a boy must complete 12 of the 24 specified achievements. He can select the ones he wants to do from four different groups: God, Country, Family, and Self. It is worn on the left pocket. The Webelos rank is the first step in a boy's transition towards a Boy Scout troop. 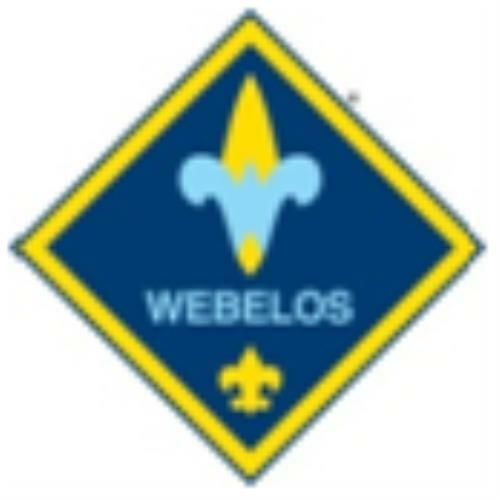 Webelos only wear the current badge of rank. 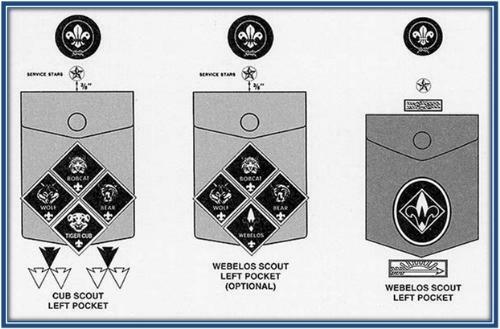 Those who have not earned the Tiger Cub rank may wear all rank badges earned with the diamond shaped Webelos badge on the left pocket. The oval badge is worn centered on the left pocket, with no other rank badges. 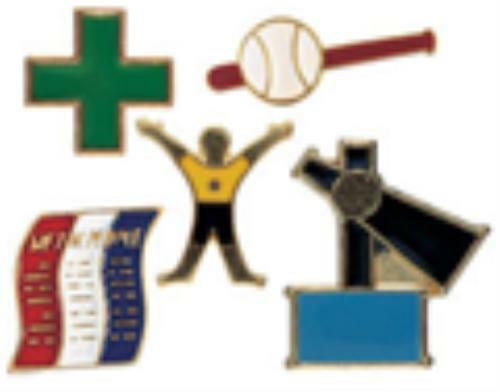 Webelos activity badges are sorted into five discipline-related groups: Community, Mental Skills, Outdoor, Physical Skills and Technology. Activity badges can be displayed on the front of the Webelos cap or on the Webelos Colors. The Webelos Colors are worn on the right sleeve immediately below the US Flag. After the Webelos badge, the compass points emblem is awarded after earning seven activity badges: four more in addition to the three earned for the Webelos badge. Wear the compass points emblem attached to the button on the right pocket of the Webelos uniform shirt. After earning the compass points emblem, a metal compass point is earned for each four additional activity badges completed. Pin the compass points on the emblem in the "E," "W," or "S" positions, in any order. After a boy has earned his Webelos badge, the next step on the Webelos trail to becoming a Boy Scout is earning the Arrow of Light Award. 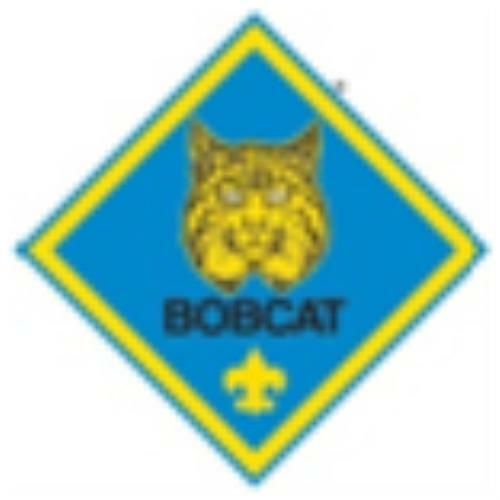 This is the highest award a Cub Scout can earn and is the only Cub Scout badge that can be worn on the Boy Scout Uniform. It is worn centered below the left pocket. The Universal Youth Religious Emblem may be worn by any Scout that completed a religious emblem program as a youth member. The award may be in the form of a certificate as well as a medallion or other memento. 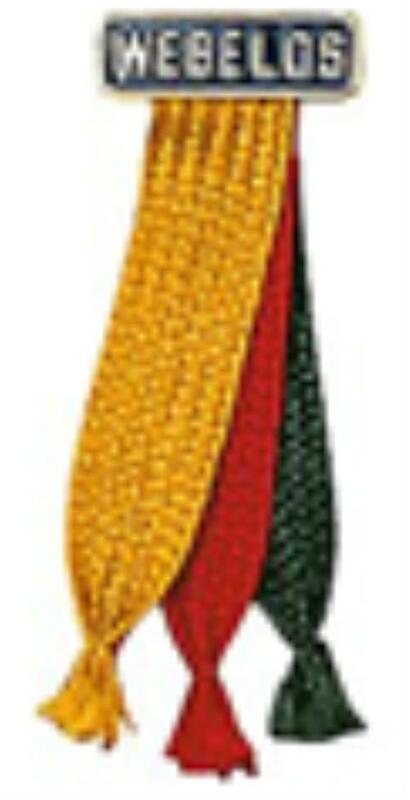 The religious emblem square knot is centered above the left uniform pocket flap. Gold metallic numbered star is worn to indicate years of service in Scouting. Only the current year service star is to be worn on the uniform, placed above the left pocket. The Cub Scout Outdoor Activity Award may be earned in each program year as long as the requirements are completed each year. The pocket flap patch will be awarded the first time, which is to be worn on the right pocket flap of the uniform shirt. Each successive time the award is earned, a wolf track pin may be added to the flap. Boys must participate in at least 3 Scouting activities during the summer (June, July and August) to qualify for the individual National Summertime award. 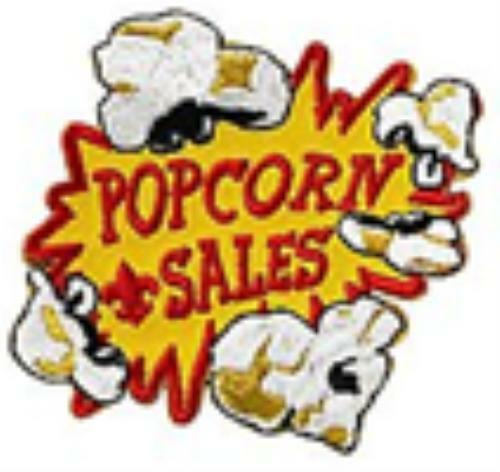 The pin is worn on the flap of the right pocket (note that the outer color of the pin differs by rank). 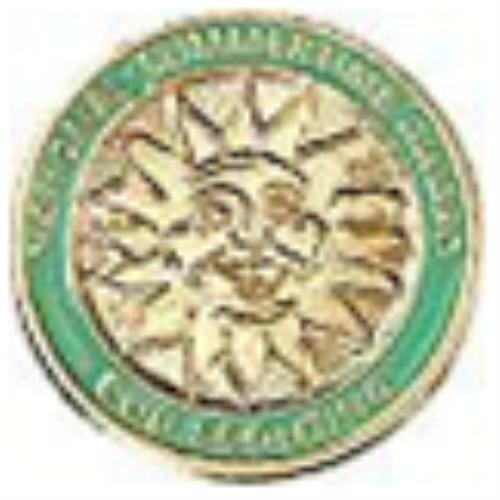 If the Outdoor Activity badge has been earned, the pin is to be worn on the badge. This cloth strip is presented to boys for recruiting another boy into the program. 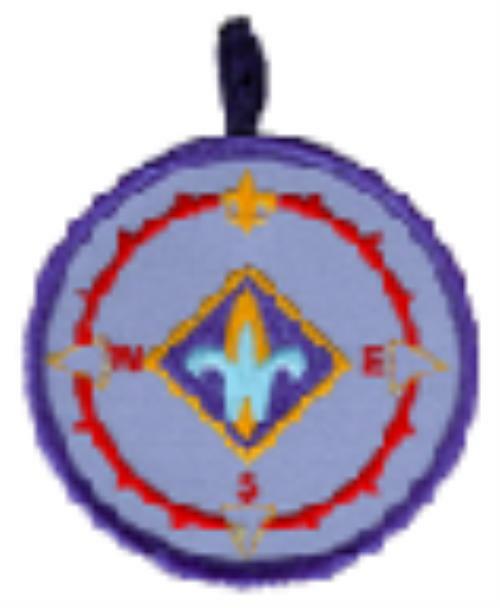 This is worn by Cub Scouts and Webelos Scouts centered, below, and touching the right pocket. 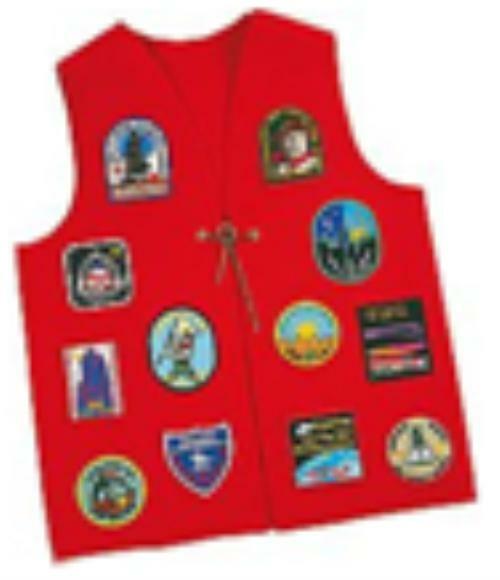 Any insignia authorized by the local council for a particular purpose, such as Cub Scout day camp or wreath sales, can be worn centered on the right pocket of the uniform shirt. 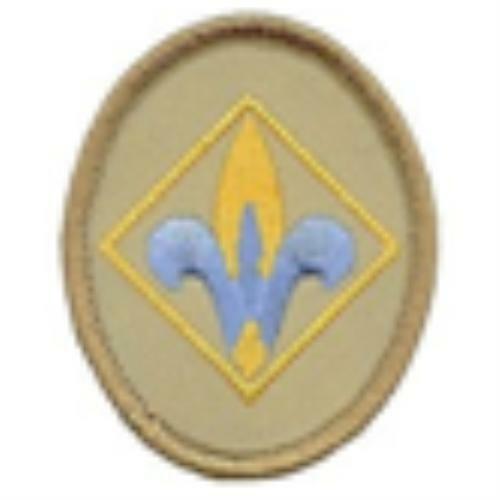 Only one temporary patch in addition to the immediate recognition (Tiger Cub Totem or Progress Towards Ranks) or Compass Points emblem may be worn at a time. Below are examples of other temporary patches: World Conservation, Good Turn for America and Leave No Trace. 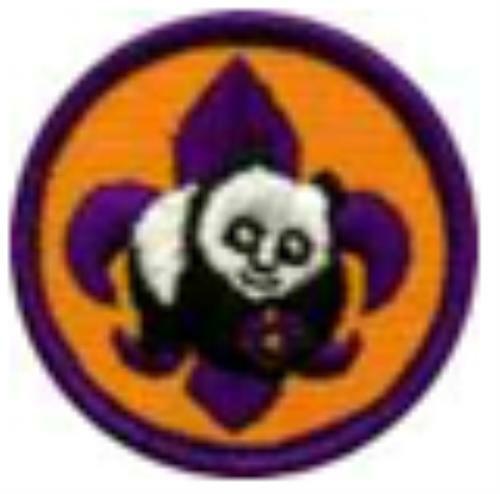 The Cub Scout World Conservation badge consists of a giant panda on a violet Scout trefoil with violet trim and gold background. The emblem is earned by completing various requirements as well as a conservation project and is worn as a temporary patch, centered on the right pocket. This award can be earned only once while a Cub Scout. 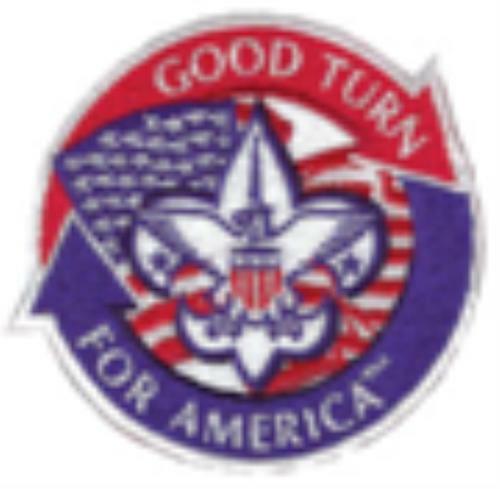 Good Turn for America is a collaboration between the Boy Scouts of America and the Salvation Army, Habitat for Humanity, American Red Cross and other community organizations. The three main issues addressed are: hunger, lack of adequate shelter, and poor health. Scouting for Food is an example. The emblem is worn as a temporary patch, centered on the right pocket. 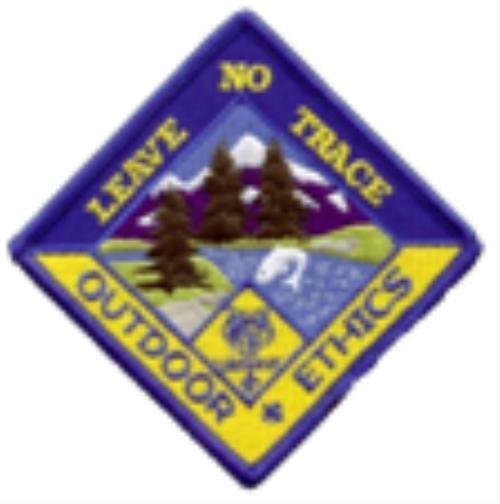 Leave No Trace is a plan that helps Scouts to be more concerned for the environment and protecting it for future generations. The message encourages people who spend time outdoors to behave in a way that minimizes the impacts to the environment. After completing certain requirements, the patch is worn as a temporary patch, centered on the right pocket. Metals from derbies or other activities can be pinned to the vest along with other patches sewn on. This includes various temporary patches, such as Day Camp or other council sponsored event patches. Recall that only one temporary patch can be worn on the uniform at a time. For further guidance on the proper placement of badges and insignia, see the BSA's Uniform and Insignia Guide or see the attached uniform inspection sheets. For more information on the various rank requirements as well as the Academic and Sports Belt Loop and Pin requirements, see the Advancements page on our website.